Moon, Sacred Water OR Holy Water as it is more commonly known. In this Sacred Water Tutorial, I will take you through my process of infusing water with the energy of the Moon. I originally posted this on a second blog I have since ended, but because this knowledge was valueable to so many I moved the post to The Magick Kitchen. 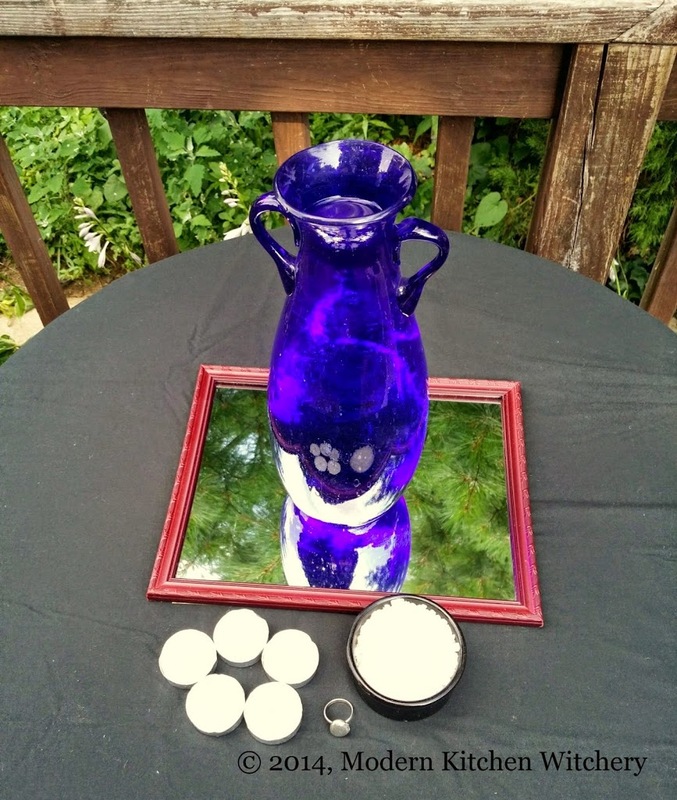 Moon, Sacred or Holy water is used in a variety of rites and rituals for cleansing, empowering, and infusing items and spell work with energy. Water is sacred in just about every tradition and has been so since humans realized its necessity for life. Making Moon water is a relatively simple process, and yet it can sometimes be tough to complete. As I always say, “Simple does not always mean easy”. This process will require your attention and preparation. This ritual is of my own making. As I tell all my students, this is a starting point. Think of it as a bit of inspiration for you to build upon. Take what I know and make your own, please don’t copy my work and call it your own. That is always bad energy no one should be looking to tempt. This ritual should be performed when the skies are clear, and there is no threat of a storm or heavy cloud cover. Making Holy Water from rain is a tutorial for another time, and you will want to be careful that wind does not blow over your vessel pver and break it. Here is what you need to create your own Holy or Sacred Water. Choose one of the following vessels: A blue or green glass container, or a Silver Cup, or a crystal bowl (i.e. Quartz/Geode, not lead crystal) honestly if all you have is a quality glass bowl this will be just fine. A sealable bottle made of dark colored glass. If you plan to store your Holy water for an extended amount of time, choose a dark-colored sealable bottle. *Repurposed wine bottles work well. You may also want to purchase a nice look growler for storing large amounts of this water. There are some nice ones on the market, and they have a good seal. Cheesecloth and piece of black cloth *This is optional and can be used to cover your vessel if you are unable to close it. 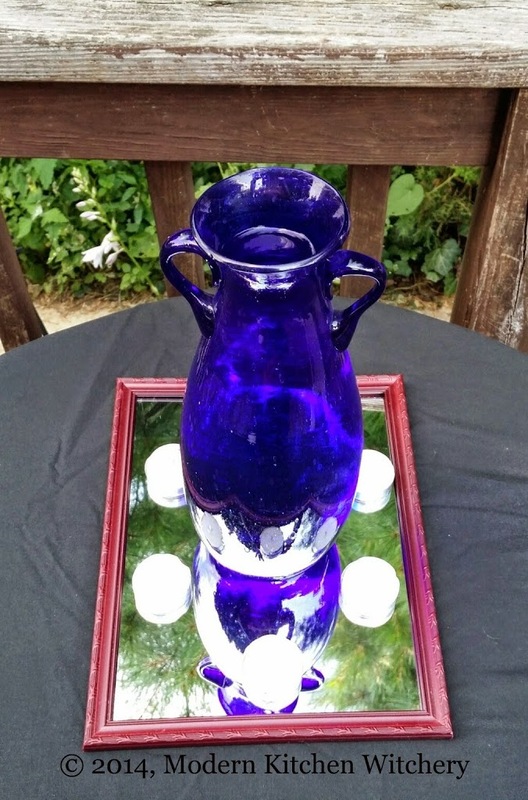 Use the cheesecloth while your vessel is out under the moon, and use a piece of black cloth to cover your bottle when you put it away during the daylight hours. Wash your water vessel and storage bottle well. Mine are dishwasher safe so through the dishwasher they go. Use baking soda and a little water on a soft cloth to clean your piece of silver well. Seriously, you want it to shine. Next rinse your glass, mirror, and silver with salted water. 2C water and 1T salt, dissolved. Ready to Infuse! 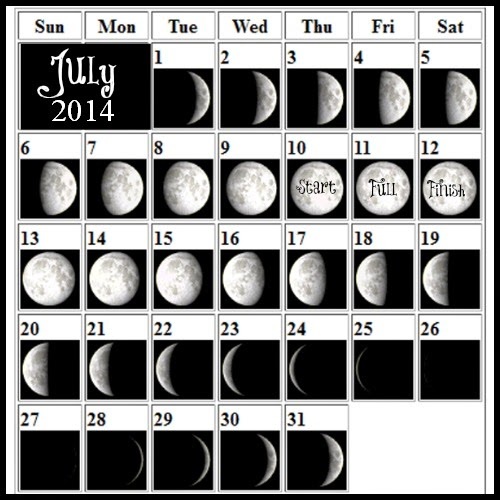 Day 14-16 of the 29.5 days Moon Cycle: This is a 3-night process. You will begin when the moon is just becoming full (day/night 14) and end on the 16th day/night) of the 29.5-day moon cycle. You will want to designate a place to keep your water when you bring it in each morning. Find a spot in a dark cupboard or on a shelf in your pantry where it will not be disturbed. After the sun completely sets, each night: Place your table outside where you know the moonlight will directly hit it. Precisely at midnight when the moon is highest in the sky. Cover your table with your black cloth and place the mirror right side up in the centre of the table. On top of your mirror place your vessel filled with water. *Now I know there is much debate out there about what kind of water to use. Honestly, use what you have. If you can drink it, its excellent water. This whole process, as long as you will it, will make your water Holy, as intended. Around your vessel & mirror place your five candles. Now here is where you will want to say something epic and significant. Yeah… don’t we all. Instead of making a fuss about memorizing a long speech, try focusing on the purpose of your water. Focus on the value of the moon and the power she offers. Think of how the moonlight will shine through the water infusing it with all the influences of the moon. If you prefer to put pen to paper, go for it! I am an “off the cuff” kind of girl. I let the words flow as the Goddess intends. As you think and speak, drop in your silver piece, and begin lighting your candles. Take a moment to soak in the moon’s energy yourself. Visualize how the moonlight will permeate you as well as the water. Cover your vessel with cheesecloth if you like and leave the moon to her work. Seriously have a glass of wine and relax. Set your alarm!!! Before the sun begins to rise each morning, you will want to bring in your vessel along with all your supplies. Place them in your designated cupboard or shelf and cover with your black cloth until the nightfall. After the 3rd night, you will have Holy Water! Pour your Holy water into your sealable container and store. So… you have Holy water…. Now what? Well, that is up to you. You can use it for cleansing and blessing. You can use it in specific feminine based rites. Use it to anoint. Indeed if there is a place in your next ritual or ceremony for water, use this stuff its GREAT! Me? Oh yeah, I use it in my Magickal cooking. I knew you knew there was a Modern Kitchen Witchery use for this water. I hope you can hear the jest in my words. But seriously, instead of water from the faucet, I replace the water needed for my recipe with this water. I find this adds an extra infusion to specific methods I don’t get otherwise. So are you ready? Get out there and try this! I would love to hear about your experiences. **Important notes: If you watch too much Supernatural, Charmed, Sleepy Hollow, Witches of East End, and the like… Please keep your comments to yourself. This is not Hollywood nor is this a Christianized horror novel. To those who think they know everything about everything, you too can keep your comments to yourself. This is a pure offering from my path and years of experience. If you think you know better, then you should write your blog filled with your infinite knowledge and experience. There is no place here for childish behaviour or posturing from cowardly internet trolls. We all walk a different path. It is important to remember that diversity is imperative. Mother Nature gets this, and so should we humans. To those who enjoy my offerings, and have something constructive to add, I welcome you and hope you stick around for more. I also would love to hear from you. I appreciate different points of view. Curious if you leave the candles burning all night long? Even though it is outside, I would still be concerned about a fire hazard. Thanks for all the good information for us new people. Of course it is not recommend to leave candles burning while unattended. This is where a snuffer come sin handy. You can snuff the flame and relight the candle at a later time when you are able to watch it more closely.